Today I’m finishing things up with the sweeter side of my recent Latin night for the ladies. I’m a sucker for mojitos but when I’m entertaining a bigger group I’d rather spend my time with guests than in the kitchen so I find that making individual mojitos is too much work. 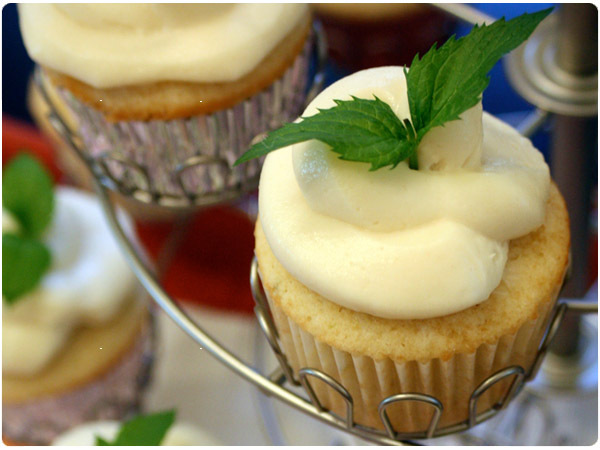 Enter mojito cupcakes! I’ve told you guys before that I like baking with booze and these treats are no exception. Tangy, sweet and boozily rich all at once. Preheat oven to 350. In a medium bowl, combine flours. In a separate bowl, beat together butter and sugar until fluffy. Beat in eggs one at a time. Beat in vanilla. Combine half and half and milk. Working in thirds, alternate in flour and milk mixtures, beating well. Add in lime juice and lime zest and beat well. Fill cupcake liners 3/4 full. Bake for 17-20 minutes. When cupcakes are cool, use a knife to carve a cone out of the cupcake center. Spoon lime curd into the center. Trim cone and replace it. Frost with mint frosting and garnish with a sprig of mint. In a small bowl, muddle mint leaves and rum and let soak for 15 minutes. Wring out liquid and discard leaves. Beat together cream cheese and butter until fluffy. Beat in powdered sugar one cup at a time, adding in rum between cups. Beat in mint extract (careful: it’s really strong so you truly only need a tiny bit!). You should aim for a hint of mint flavor with the frosting – nothing overpowering. Add flour as needed to thicken. 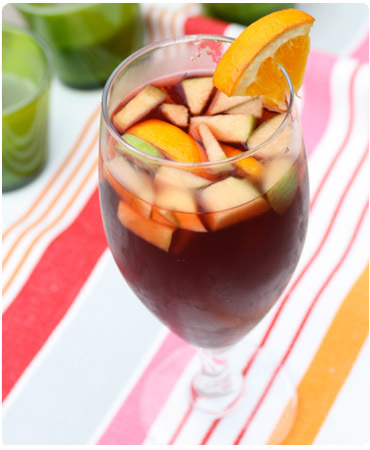 But if liquid desserts are more your speed, a classic red sangria is a great pick when you’re entertaining a crowd. Chop fruit into bite-size chunks. In a large pitcher combine wine, brandy, sugar and orange juice. Stir well to ensure sugar is dissolved. Add seltzer and stir. Add fruit. Let chill for 1-2 hours to combine flavors. Note: You can also use berries or grapes if you wish. These sound delicious! One question – where do you find lime curd? Thanks! Yes, please let us in on the lime curd. They look really good! Hi ladies! You can find lime curd at most grocery stores. I used Dickinson’s brand. It’s usually located by the jams and honey. What kind of red wine do you use to make the Sangria? Does it matter? I like to use a Spanish wine like a Tempranillo or a Rioja, although I think an Argentinian Malbec would be nice too. Those are all pretty easy to find at a good liquor store. I wouldn’t use anything too zesty like a Syrah/Shiraz style or too soft like a Pinot Noir. Hope that helps! How much flour for the cupcakes? Ha! Oops! It’s 1 1/4C all-purpose and 1 1/2 C self-rising. Thanks for noticing! How many cupcakes does this recipe yield? Oops sorry about that! Depending on how full you fill the cups, it makes about 15 Texas size cupcakes or about 30 standard cupcakes. Awesome, thanks! I’ll be using this recipe this weekend!